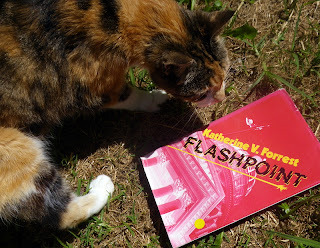 Flashpoint by Katherine V. Forrest is an interesting book that brings to life some very different gay and lesbian characters and gives us a window back into the early days of gay rights activism. Set in 1991, on the night that the Gay Rights anti-discrimination bill in California, that was intended to prevent discrimination in the workplace, was vetoed by the current Governor, allegedly at the command of then-President, and fellow Republican, George Bush Snr. (though he wasn't 'Senior' at the time). Having been warned in advance through her activist connections, Donnelly gathers up the people she most cares about in the world for support, and then tries to persuade them to take a more active part in the movement. The cabin throws an interesting collection of a wide range of gay and lesbian personalities (five lesbian, two gay men), both young and old, into close proximity, forcing reminiscence of their very different lives and experiences, and all kinds of adjustments to each other. While the majority of the story is set in the cabin over a couple of days, we get some scenes from later on. As a result of the veto of what was apparently a sensible shoe-in of a bill, gay people were galvanised and became a powerful presence, throwing themselves behind newcomer Bill Clinton - who, of course, won the presidency at the next election. Donnelly is a strange sort of character - all four of her lovers adore her, and yet she is the one who cheated on, and left, each of them. She's a certain, passionate, big picture, activist, who doesn't even notice the small details of how things are and just acts to makes things as they should be. For example, casually explaining to Bradley's homophobic parents that they were both gay, which is why she was divorcing him. Bradley is a meek, quiet and generally nice man, a publisher who left his teaching career because of discrimination and plays it safe, while quietly supporting gay rights as unobtrusively as possible. He's together with Warren partly because they are both clean of HIV and they're both feeling guilty about that. He was Donnelly's husband for years, until they both came out to each other, and still considers her his best friend. Sixty year old butch Pat owns the cabin, and is still trying to figure out why her mother left it to her - not having had the best relationship with her family. She had one of the most miserable back stories - she always looked like a dyke and faced intolerance her whole life, had a disastrous marriage, a lover that deteriorated into alcoholism and drug use, a job she was fired from after nineteen years, supposedly because of her lesbianism... and then she met Donnelly and managed to rebuild herself. Averill is a selfish, focused sports professional who lives for golf and is utterly paranoid about ever uttering an opinion to the press, much less coming out. She's disliked by everyone except Donnelly and Angela, her current lover. Most of her thoughts are concerned with golf, golf and more golf. Angela and Warren and Querida are all a generation younger, and all much more open about their gayness, and much less damaged. Angela's a lovely, nice femme who instantly hits it off with crusty old Pat and sees the best in everyone. She doesn't really have any kind of story to tell - she plays secretary for Averill and travels around with her. Warren is a fiery activist, who has lost too many friends to AIDS and lives on the fringe of the activist movement. He doesn't really understand his cautious elders, and appears extreme to most of them. He's also rather jealous of Bradley's attention to Donnelly. Querida is one of the interesting ones - a Latino woman in her twenties, from a family that lived in poverty, she's a successful Latino businesswoman who lives in the world of white people. She's highly active in raising awareness of the Latino population, less so in the world of queer rights. She's Donnelly's current lover, and the person she respects most in the world is her grandfather. The book is divided into short chapters, or scenes, each titled with a classic song from the seventies or eighties (e.g. "Fire and Rain", "The Sounds of Silence", "I Heard It Through The Grapevine" and "What's Love Got To Do With It?") which is tentatively in theme and supposedly playing on the radio. About half of the story is actually taken up with flashbacks and reminiscences from various characters. It's a vivid snapshot of what life was like for gay and lesbian people twenty years ago, and what it does really well is evoke the politics and the emotions and all the inspiration and drive behind the roots of queer activism that we don't always see today. It's the story of the midpoint between here and a hundred years ago, when gay people are finally starting to stand up and say 'this isn't right', and actually start becoming a significant force in culture and politics. It comes during the worst of the AIDS epidemics, and that constant loss of young gay men is a constant pain in Bradly and Warren's lives. It's very similar to Curious Wine in some ways - the overall plot is different, but the story of trapping a handful of people who dislike, or at best tolerate each other (with a few pairings), in a reasonably luxurious cabin out in the wilderness. Forced into close proximity, they strike sparks, get to know each other, or do their best to ignore each other. Donnelly is notable by her absence - even when she arrives on the scene, she doesn't stand out, or take over the narrative at all until into the second half of the book, which is especially odd given how smitten everyone is with her. It's all about their relationships and history, not her. And the second half is all about the activism and discrimination and politics, so she plays a larger part. It's not a particularly whirlwind plot, but it becomes a gripping snapshot of what living gay, in or out of the closet, was like, and the events of the 1991 'flashpoint'. And while I wouldn't have rated it particularly highly halfway through the book, the long, rambling and in-depth introduction to each character meant that the end of the book hit a lot harder. You can buy Flashpoint on Amazon.com and Amazon.co.uk secondhand, as a hardback or paperback, but it has not been reprinted or made available as an ebook.